As part of their undergraduate training all archaeologists participate in a field school. There were five field schools held in Minnesota by various state institutions this summer. The University of Minnesota Twin Cities, Department of Anthropology held their field school at an historic site in Old Wadena County Park where they continued the investigation of a multi-component site that includes a significant French colonial period fur trade location, and the initial survey of a second reported fur trade site. They also managed to get in on the Wadena tornado for some added excitement. Minnesota State University-Mankato investigated several sites in the Red Wing area, including a couple of sites across the Mississippi River in Wisconsin. Fieldwork included surveys for new sites along Spring Creek and test excavations at sites discovered by the 2006 field school. One of the sites investigated appears to be a single component Oneota site were students discovered large intact pit features just below the plow zone, indicating that the site has great research potential. The University of Minnesota Duluth continued excavations at a group of aceramic (without pottery) sites in the Bay View School Forest in Duluth. Then students headed north to the Boundary Waters Canoe Area to do some site survey for the National Forest Service. St. 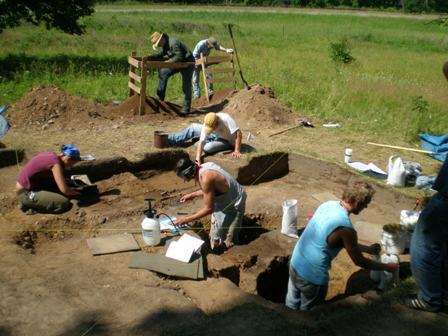 Cloud State University archaeologists excavated at the Shoemaker site, located on the campus. Students are studying the community of Lowertown, occupied in the early 1850s by European-Americans who came to St. Cloud from eastern states. Lowertown homes and businesses were located underneath what is now the SCSU campus area. Minnesota State University-Moorhead field school participants were involved in a county-wide survey for archaeological sites in Swift County. Swift County is located in west central Minnesota. The county-wide survey is one of the archaeological projects being completed using funds from the Clean Water, Land, and Legacy Amendment. The students relocated previously recorded archaeological sites and found a number of previously undocumented sites in the county. Legacy Amendment funds are being used to fund two county wide archaeological surveys. The Board overseeing the distribution of legacy amendment funds selected two counties where the nature of the archaeological resources are relatively unknown, Olmsted and Swift Counties. Olmsted County is located in an area that has had limited study by archaeologists and has been the location for the discovery of two very early sites by non-archaeologists, suggesting that the county might contain information about some of the regions earliest inhabitants. Swift County has only 15 recorded archaeological sites and there have been no professional archaeological excavations done there. The consultants doing the survey will revisit known sites, interview collectors and local residents, and do field survey across portions of the counties. The goal for each of the surveys is to develop a summary of the prehistoric past for each of the counties and develop a narrative model of site locations to help predict where in the landscape sites might be found. This will allow for the protection of important archaeological sites in areas of rapid development such as near Rochester and also help to better understand the prehistoric cultures in these counties. A portion of the field work was completed early this summer when crop and field conditions allowed for good surface visibility, but survey is continuing through the summer with the excavation of shovel tests in wooded and grass covered locations. The survey in Swift County is being done by Minnesota State University Moorhead and The Mississippi Valley Archaeology Center is doing the Olmsted County survey. 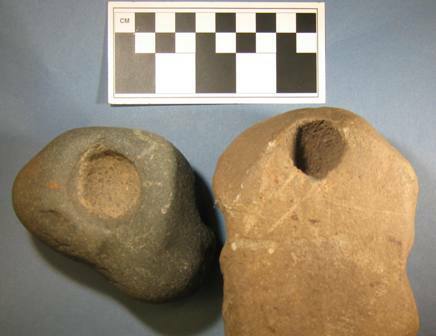 One of the most common non-artifacts shown to archaeologists are cobbles with spherical voids in them referred to by geologists as omars. Admittedly this was also the first thing I found when I was younger that I thought might be an Indian artifact. These are generally blue-gray to green-gray cobbles with round holes or depressions in them. Omars are often thought to be paint pots or bases for fire starters or drills by their finders. While they could have functioned as such, they often show no evidence of the wear or polish within the depression that such uses would have produced. 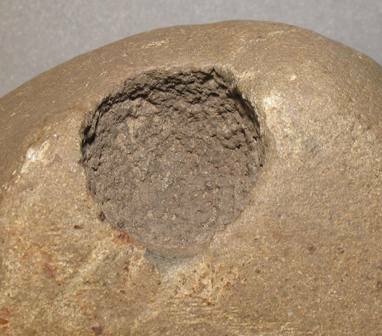 The holes are the result of the weathering of calcareous concretions from the stone. The base stone being harder is more resistant to weathering and the softer concretions weather away leaving the spherical holes. Here’s a link to a scientific article discussing omars and how geologists use them to track the movement of glaciers. 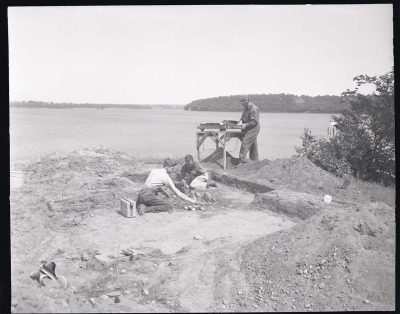 In July the Science Museum of Minnesota and Minnesota State University-Mankato excavated at the Ranelius site in Spring Lake Park near Hastings. The dig was funded by a grant through the Minnesota Historical Society funded by the states Clean Water, Land, and Legacy Amendment. The work was undertaken to supplement and expand upon research completed at the site in the 1950s by the Science Museum. Fieldwork was completed by the end of the third week of July. Ed Fleming, curator of archaeology at the Science Museum has been writing a blog on the project. 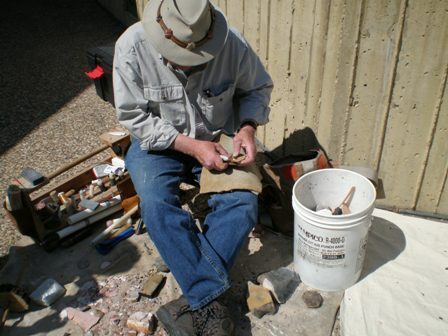 Rod Johnson, President of the Minnesota Archaeological Society will be demonstrating how stone tools like arrowheads are made at the Welch Station access of the Cannon Valley Trail on Saturday September 4, 2010. Rod will be set up at the Welch station from 11 am to 4 pm. The trail runs from Cannon Falls to Red Wing and is an enjoyable days outing. At a couple of locations along the trail near Red Wing there are interpretive signs explaining archaeological sites adjacent to the trail. 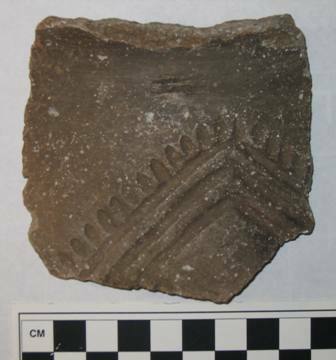 The Cannon Valley Trail web site also has a page about the cultural resources found in the area. Welcome! Our goal is to make this the up to date location to find out what is happening in Minnesota Archaeology. We will include posts about upcoming or recent archaeology related events, interesting places to visit, and ongoing research. Hopefully this will evolve into a useful site for both professional archaeologists and the interested public. Author EhmePosted on August 23, 2010 Categories archaeologyLeave a comment on Hello World…..